We're at the end of 2018 and honestly, I couldn't be happier. While this year had tons of ups, it definitely felt like I was dealing with a lot of growing pains as well. I recognize that tomorrow won't actually be any different... but feeling like you have a fresh start is definitely the motivation I need to make 2019 the best year yet! Today's post is dedicated to looking back at the high points of my personal style this past year. 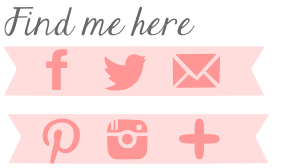 Lots of Disneybounds, more small business features, and some style changes are all featured below! I'm looking forward to a more casual style with a vintage flair in 2019. As much as I love all things vintage, I now have a job and wearing big skirts and anything with boning just doesn't work for me anymore! I'd like to get back into makeup tutorials, more creative photography, and more features on my dogs and family. Is there anything you'd like to see from me next year? Let me know in the comments below! I hope you have an amazing and safe New Year's Eve and look forward to whatever is in store for 2019! 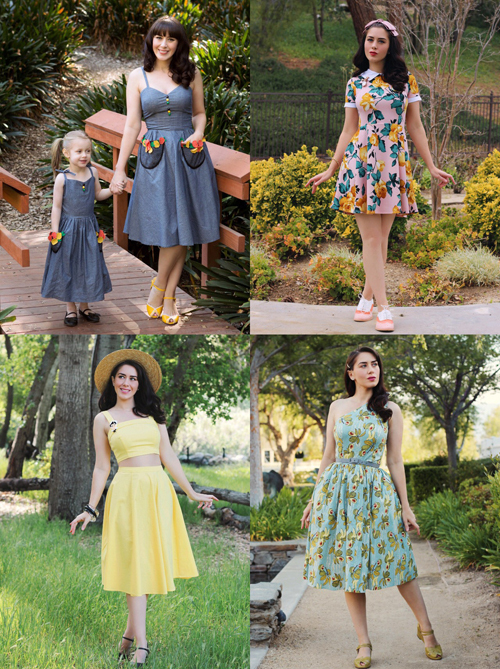 I feel like it's been much too long since I've featured a Disneybound outfit on this blog. Now that I'm working and Bianca is in school, our Disney trips have come to a complete halt. Let's be real though: you don't need to be at the park to Disneybound! Vintage Inspired by Jackie has been my one and only source for Disneybound outfits and she really outdid herself with this one. 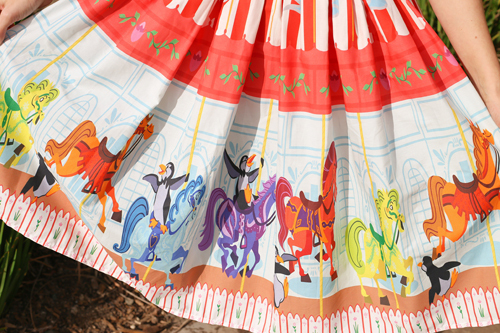 As a child, I was obsessed with the Jolly Holiday scene from Mary Poppins and I can't tell you how excited I am that I now own a dress to commemorate that scene! This new dress style features a sweetheart neckline, lined bodice with boning, adjustable spaghetti straps, off the shoulder sleeves, a full gathered skirt with a hidden side pocket, and a back zippered closure. I love how I can wear the straps up or down and I appreciate that they're adjustable as well. This dress was made to my measurements and (as always) it's spot on. The bodice is really supportive that I didn't even need to wear a bra! 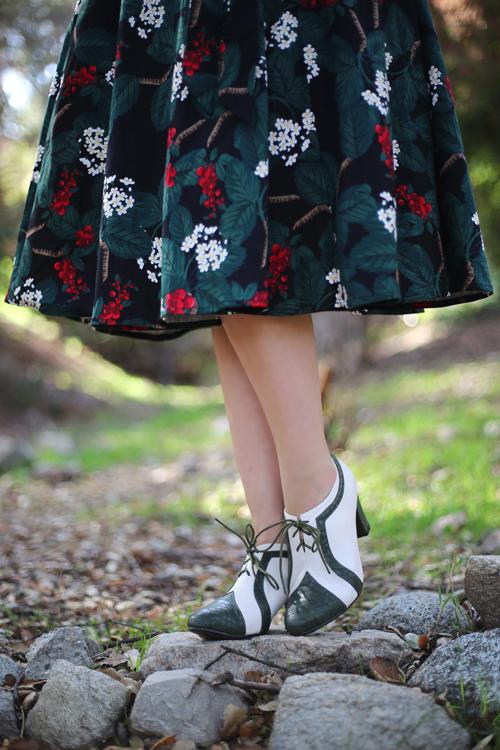 I chose to skip the petticoat for these pictures, I wanted to show you how full this skirt is on its own. I'm counting the days until I can wear this again, hopefully when I visit Mary Poppins in the park in a few weeks! 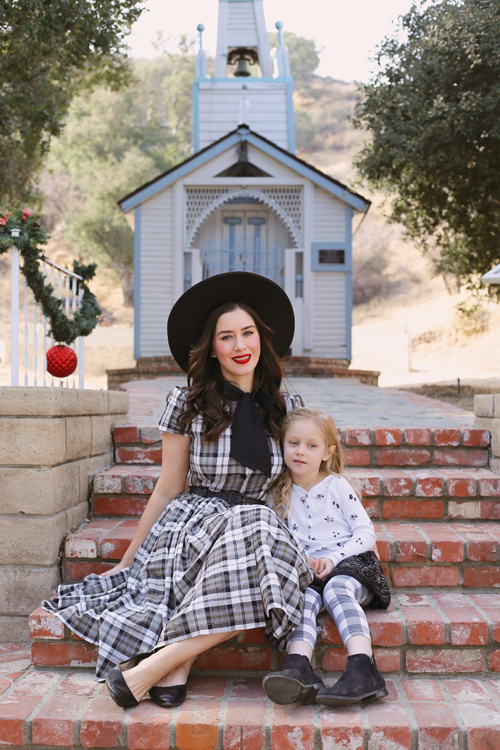 Jackie is currently running a birthday sale (she's a fellow Capricorn like me) so this dress and everything else on her site is currently 20% off! Now is the time to take the plunge and order the dress of your dreams at a fantastic price! Today is Christmas Eve and I'm kind of sad about it. I feel like I didn't do enough "Christmas-inspired" activities this year. Because of my new job and Bianca starting school, we didn't have time to see Disneyland during their holiday time, visit Santa, or send out Christmas cards. This year kind of feels like a massive fail. Luckily, we still have today and tomorrow to jam in as much as we can! 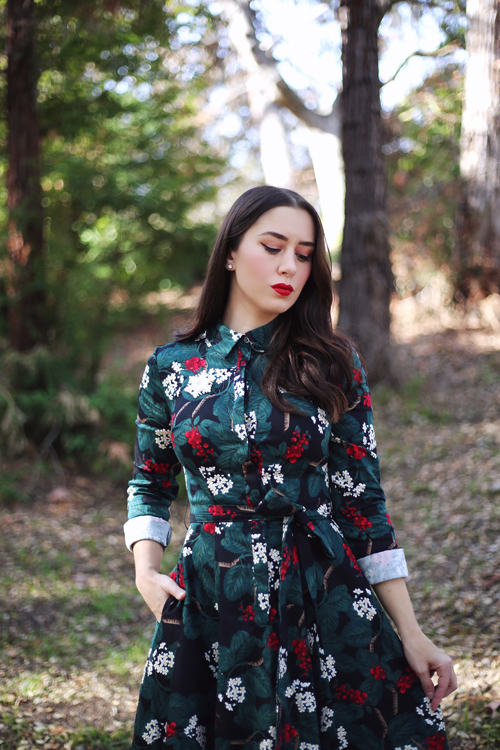 This Unique Vintage dress feels really festive without being holiday restrictive and I can't get enough of it. It really matched well with the holiday decor at my local historical society, which I happen to visit about once or twice a month. The old homes (and this church) have a super creepy aura around them and I love it. 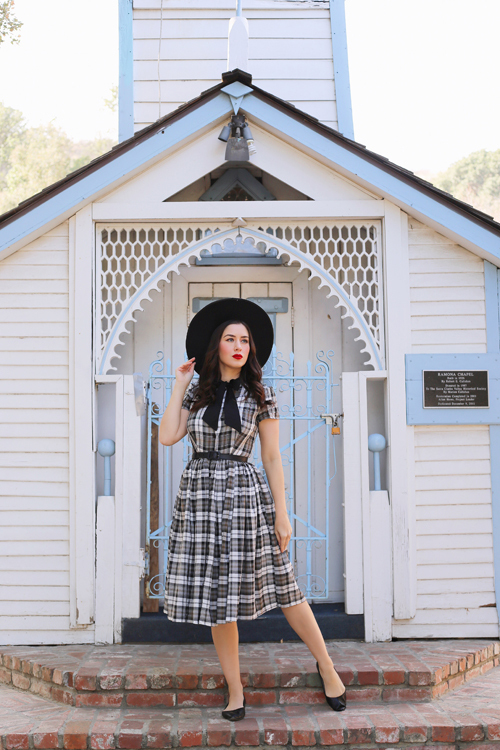 This plaid dress is made from a lightweight woven cotton and features a large tie at the neckline, button front closure, short sleeves, and a full gathered skirt with hidden side pockets. I'm wearing my usual Unique Vintage size small and it definitely fits perfect in the bust. The waist is quite big, but it's not noticeable when I add a belt. I can't lift my arms all the way up when I wear this dress, but the sleeves are otherwise pretty functional. I really love this dress and I hope they make more versions (especially solids and stripes) in the new year! Tomorrow is my birthday and unlike other people in their 30's, I'm quite excited! While aging isn't the most fun thing in the world, the confidence I've gained in myself is worth the ridiculous skincare regimens I now have to follow. I'm looking forward to spending it with my family and enjoying a nice dinner with the people I love. Not gonna lie, I'm also excited to open my presents from Kevin. I didn't give him a list this year and I'm dying to know what he got me! Can you believe that Christmas is in just one week? To be honest, I'm nowhere near prepared. Presents still need to be wrapped (some still need to be purchased! ), stockings need to be stuffed, and I haven't even really figured out what we're doing on the big day. To nobody's surprise, my outfit was the only thing I planned ahead of time! 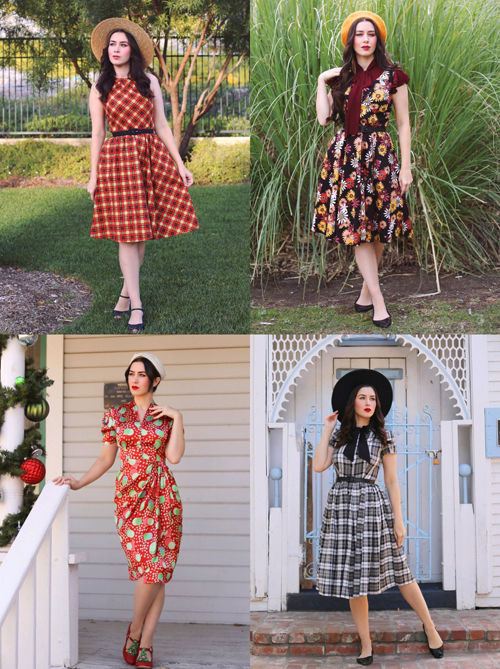 When Seamstress of Bloomsbury released this Mabel dress I knew it was the perfect dress for the holiday season. Silky smooth, super comfortable, and festive enough without being kitschy. Like everything else I own from them, this dress is a high quality garment and made to last for many seasons to come! The Mabel dress is made from a satin fabric and features non-functional covered buttons down the bodice, top shoulder smock detailing, a slight puffed sleeve, tulip skirt with delicate draping on the left side, attached back self tie, and a side zippered closure. I'm wearing a size UK10, which is my normal size in Seamstress of Bloomsbury, and I really like the fit. The back tie allows me to cinch in my waist, which I love. 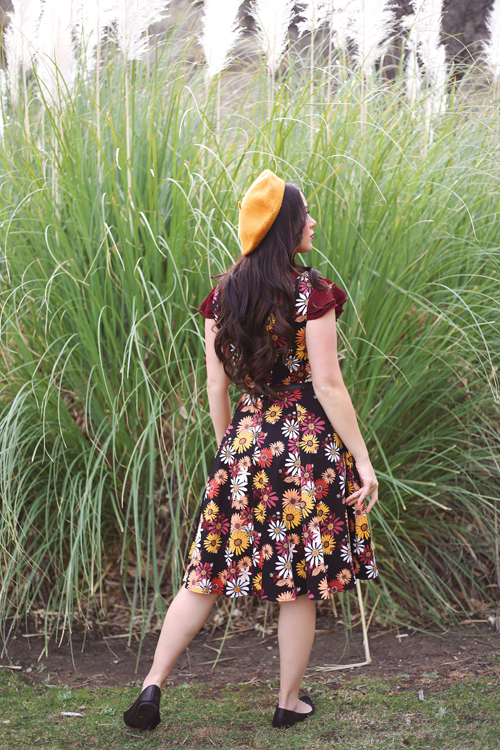 I think this dress is incredibly beautiful and looks great with my festive shoes and vintage hat! What are your plans for the holidays? Do you tend to get dressed up or do you have a more relaxed holiday? Let me know in the comments below! 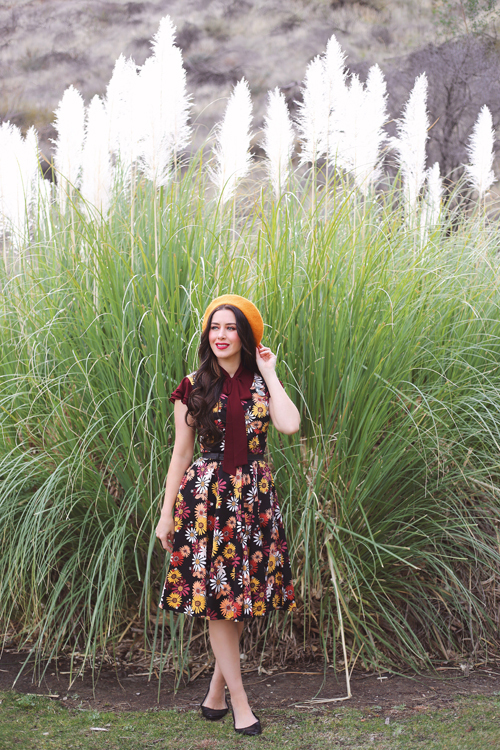 Who doesn't love a fun outfit to combat those soon-to-be winter blues? 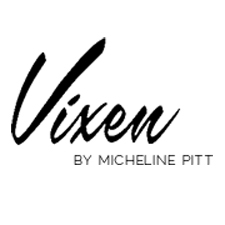 I've teamed up with Modern Millie, a woman-owned small brick and mortar shop in Salem, Massachusetts with an online store as well. 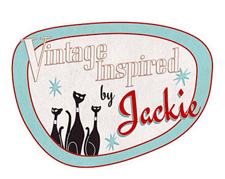 They offer all kinds of vintage inspired clothing, including plus sized and kids clothing, and showcase their flair for fashion with their one-of-a-kind styling and accessorizing. Read more about this amazing business and my outfit below! 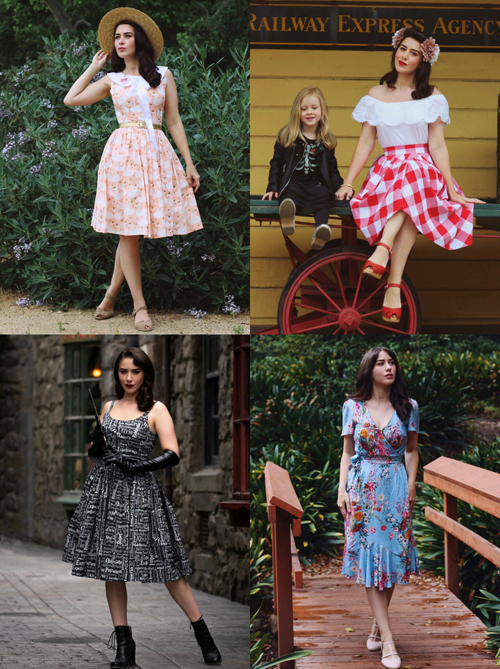 "Christine opened Modern Millie about 13 years ago when we sold only True Vintage and Modern Consignment, and Laura came on board just a few months later! 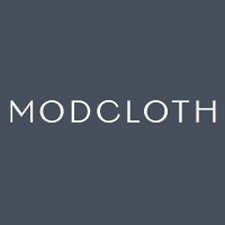 Over the years we have grown, changed, and have evolved into a mainly vintage-inspired clothing store with a carefully curated true vintage selection. We choose pieces for our store that we love to wear, that still have that vintage feel, designed by people we love to support. As a small independent business, we love carrying brands who are either small themselves or who started small and we love to share their stories with our customers! 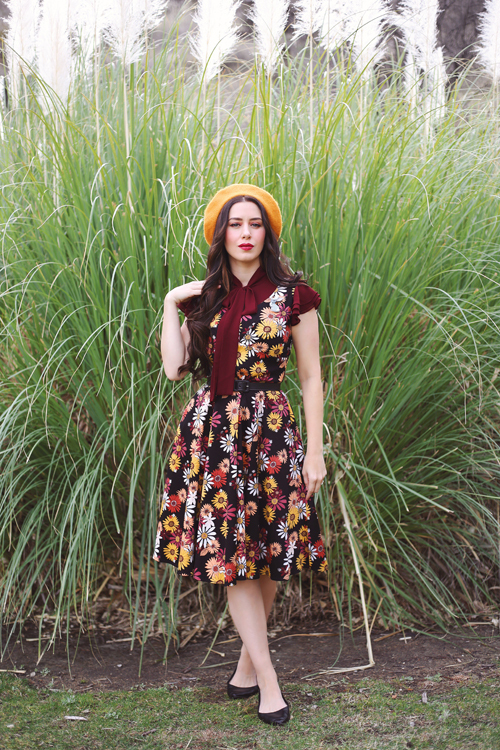 Though we carry many of the same brands as other vintage-inspired stores, we consider ourselves to be unique in the way we style our pieces to make them our own! We love print-mixing, layering, winterizing our sleeveless dresses with tie neck blouses and we use lots of color! Winter in New England is long, cold and void of color, so we do what we can with fashion to keep things cute cozy and lively! We love to inspire our customers, and encourage them to express themselves through fashion, take risks and most importantly feel beautiful in what they are wearing!" I literally do not let anyone pick my outfits, but when Laura offered to style me personally I couldn't say no! 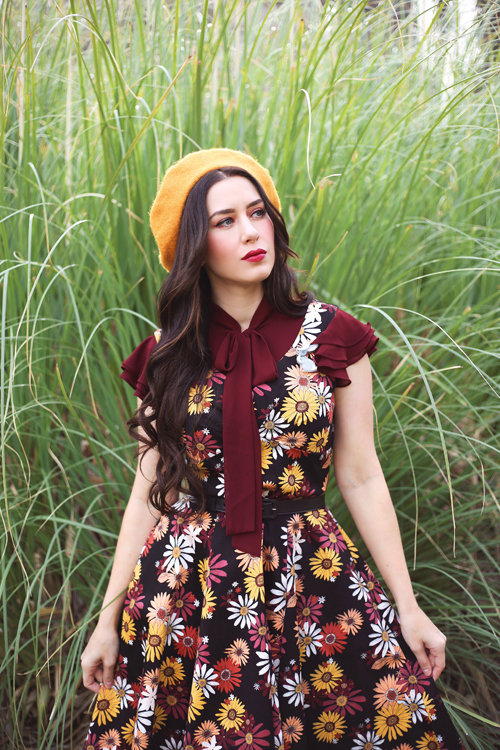 She picked this amazing fall floral dress and paired it with this flutter sleeved bow tie top that matches perfectly. I love this outfit so much! I'm wearing a small in both pieces and I find that they fit quite well. I did have to belt the dress for my waist, but only because I'm a small in the bust and an extra small in the waist (I have to do it all the time). The dress is made from a soft but sturdy stretch cotton and features a gorgeous full skirt complete with pockets. The top has a chiffon-like weight and looks wonderful on its own or layered under this beautiful dress. 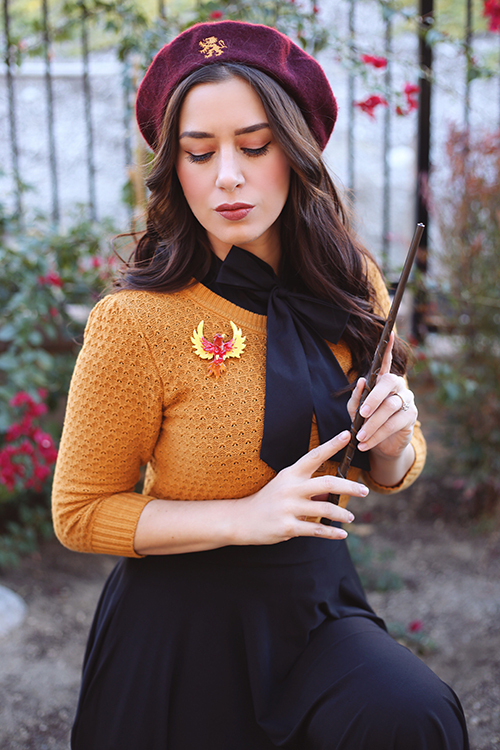 I added some extra flair with my beret and brooch and I'm pretty sure this is one of my new favorite outfits. Thank you Modern Millie! Even if you're not local to Salem (like myself), you can still shop with them online and find all of their amazing styling tips and tricks on their Instagram. 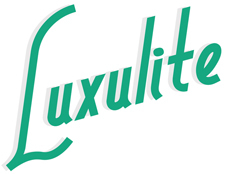 Make sure to give them a follow HERE and shop their online store HERE! 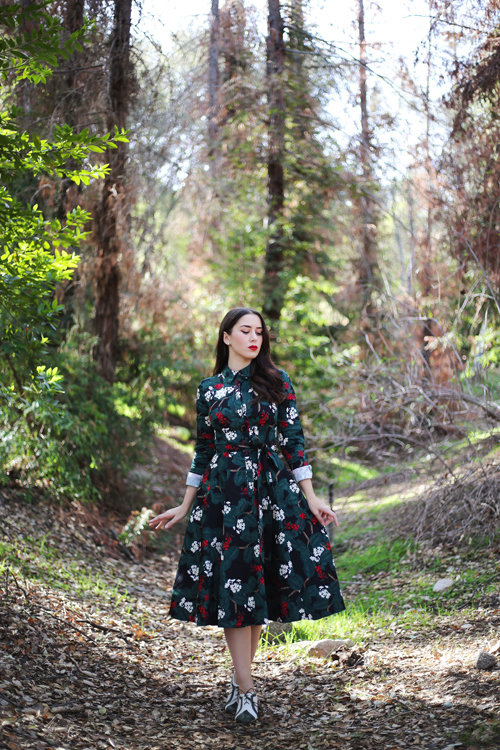 It doesn't feel like the holiday season until I've wandered around a forest in a pretty dress! 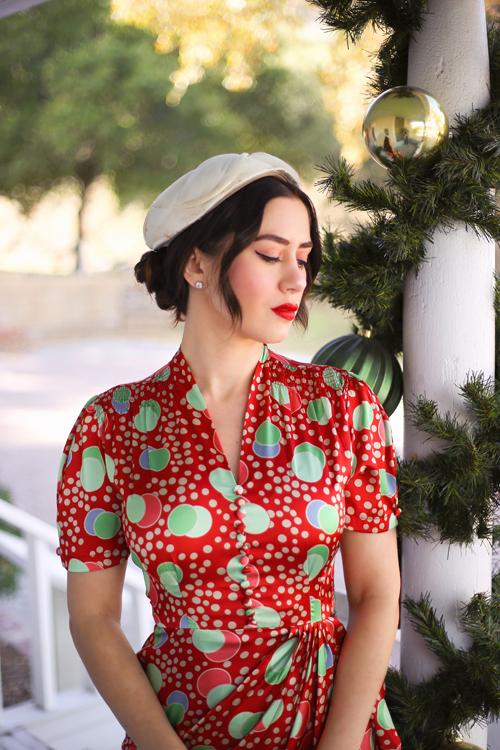 Collectif recently released their Mara dress in their new Wild Berries print and I must admit: it's a great holiday dress! A classic shirtwaist style with modern details (deep pockets, y'all!) 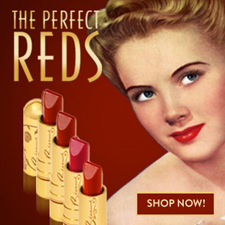 is the perfect pairing for this vintage style-loving gal. Topped off with with matching Lulu Hun shoes and a cheery Erstwilder snowflake brooch and this holiday outfit is complete! 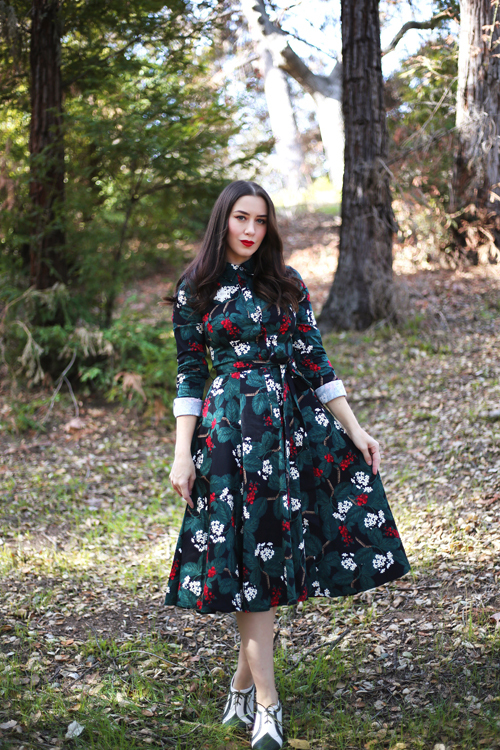 The Mara dress is made from a sturdy but stretchy fabric and features a pointed collar, functioning buttons down the entire dress, long sleeves with button cuffs, a full circle skirt with pockets, and a matching fabric self tie sash. I took my usual Collectif size (UK8) and I felt like the bodice was a little smaller than usual but not enough to size up. Since I live in a warmer climate, I decided to roll up my sleeves a little and I really liked how the cuffs complimented the color of my shoes. Overall, I think this is a wonderfully festive outfit that is just as comfortable as my onesie pajamas (yep, I definitely own some of those)! Are you ready for another amazing Erstwilder release? Well it's here (as of literally right now) and this range is right up my alley: Myths and Legends. Thirteen brooches, a pair of earrings, and two necklaces round out this whimsical collection of fairies and mythical creatures. I've shared my favorites from the collection below! 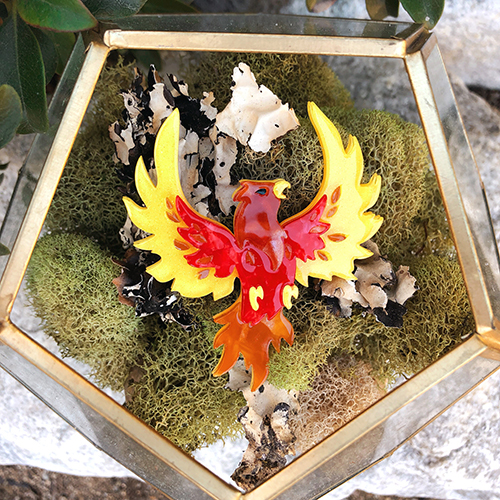 Fiery Fawkes is such a stunning addition to my collection (and outfit!). 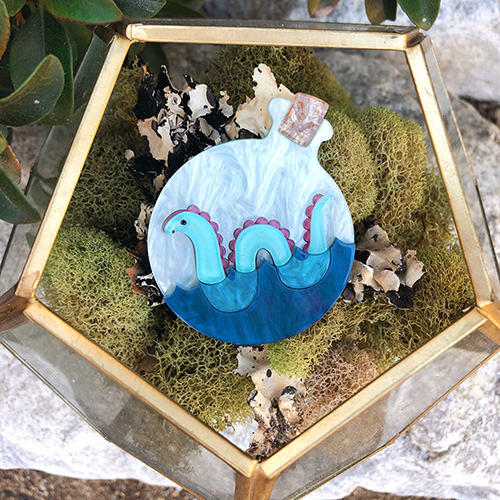 I love the vibrant colors throughout and the resin also has a hint of sparkle. I'm pretty sure he's Dumbledore approved! 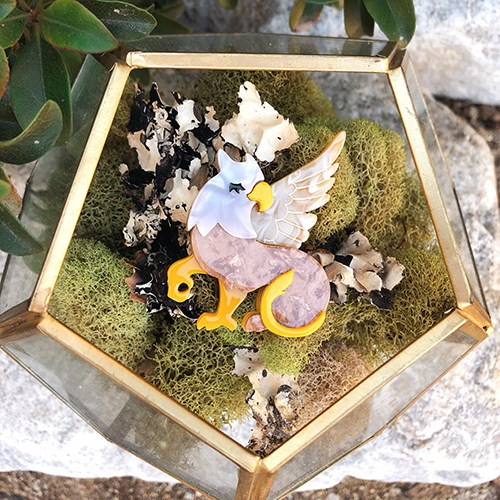 Treasure Keeper is everything I've wanted out of a hippogryph brooch... Especially because he's the first one I've seen! I love his beautiful marbled resins and that regal smirk is just everything. He's a great size too: easy to read but not overwhelming! My husband is Scottish so I just had to add Tess to my collection! I love how she's somewhat submerged in the water but you can still see her entire body. Tess is made from a vibrant resin encased a lovely iridescent marbled resin "bottle". She's certain to get a lot of wear! 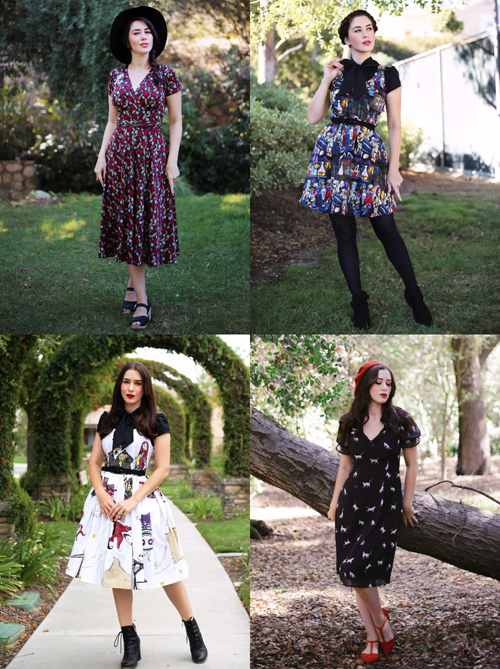 You can find the entire collection HERE! Which ones are your favorites? Let me know in the comments below!